A few years ago, Disney and Pixar released the film, Up! 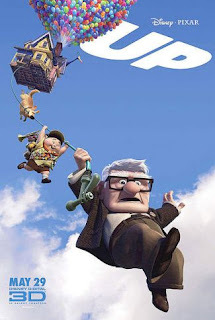 In the film, Carl, a widower, sets out on an adventure to keep a promise to his beloved, late wife, Ellie. He ties a great number of balloons to his Victorian, until the house rises. As he and his house ascend from the old neighborhood, and set out for his destination, the lonely widower seems to think he will feel closer to her. Jesus, as He draws His earthly pilgrimage to a close, sets out on the ultimate adventure to keep His promise to His beloved Bride, the Church. As He ascends from the Mount of Olives, and sets out for His heavenly destination, Jesus goes away, in order to actually be closer with her. There is the blessed paradox. Jesus goes away, in order to be closer to you. Now, He in His risen and glorified and ascended body, can keep His promise and be with you always, in His Baptism, preaching, and Holy Supper. As He walked this earth before His suffering and death, Jesus was in one place at a time. He confined Himself to the normal earthly limits that we face, of just being in one location. Now, after He is risen and ascended, His glorified body is at the right hand of the Father. The Father is everywhere, and so is His right hand. And Jesus promises to be wherever His Gospel is proclaimed and where His Sacraments are given. In the film, Carl and Ellie had admired an early 20th century adventurer and explorer. In the end, he turned out to be quite deceptive and evil. Life can be full of Charles Muntzes, looking appealing, seeking your admiration, and promising adventure, but with hearts far from the Lord. Do not give in. Do not fall for the tricks and lies of such deceivers. Do not seek the Lord where He does not promise to be. When you stand, gazing into heaven, looking for some bodiless, spiritualized, ghostly Jesus, you ignore Him in the very body where He promises to be located. In the holy font, your baptized and ascended Lord comes to you, and washes you into salvation. From the pulpit, Jesus locates Himself in the preaching of your pastor. On His holy altar, Christ Jesus places His holy Body and Blood in and with the bread and wine, removing all doubt that the risen and ascended Lord is come in the flesh! And now that He is ascended, your risen and glorified Lord makes Himself located in these many places, all at once. Your Old Adam yearns for excitement and adventure, imagining that life should be full of grand and amazing moments like the Ascension. But remember the truth contained in the note in Ellie's scrap book: "Thank you for the grand adventure." Carl thought he had not given here any adventures, and was sad that life had been so ordinary. But really,it was a marvelous adventure. Your life in Christ is that, and even more. When He comes in His Word and Sacraments, it seems so ordinary, and like there is no adventure or excitement. But the joy of your Ascended Savior is that by coming through such ordinary means, he gives you the grand adventure of forgiveness, life, and salvation, blessing you until this same Jesus that was carried up into heaven, returns and gathers His bride the Church for an eternal, holy, and grand adventure. Amen.